A village located 11 miles (18 km) southwest of Peebles on the Biggar Water in the old county of Peeblesshire, Broughton is noted for its ruined church which includes a cell allegedly occupied by a 7th Century missionary. Sir Basil Spence built Broughton Place (1937), on the site of the burnt home of Sir John Murray of Broughton (1715-77). Born in Broughton, Murray acted as Prince Charles Edward Stuart's secretary but gave evidence against him after the failure of the 1745 Rising. The Greenmantle Brewery, established in 1979, produces bottled ale. 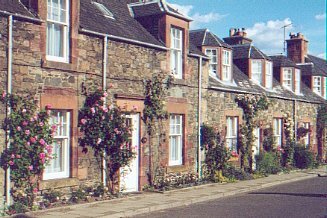 Broughton was the home of Helen Masterton, mother of author and statesman John Buchan (1875 - 1940). Here she met his father, who was Minister of the the former United Free Church, which dates from 1846. This became the John Buchan Centre in 1988 but moved to Peebles in 2012. Although the Buchans moved away shortly after they were married, the family regularly returned to Broughton on holiday. Opened in 2003, the John Buchan Way begins in the village.